Daniel Benedict´s Masters of the Universe fan film has some pretty awesome accessories, which Daniel was kind enough to let me sculpt and offer as 3D printed items! Found by Shadow Weaver and used by Evil-Lyn, this magical artifact drains the energy of living beings. 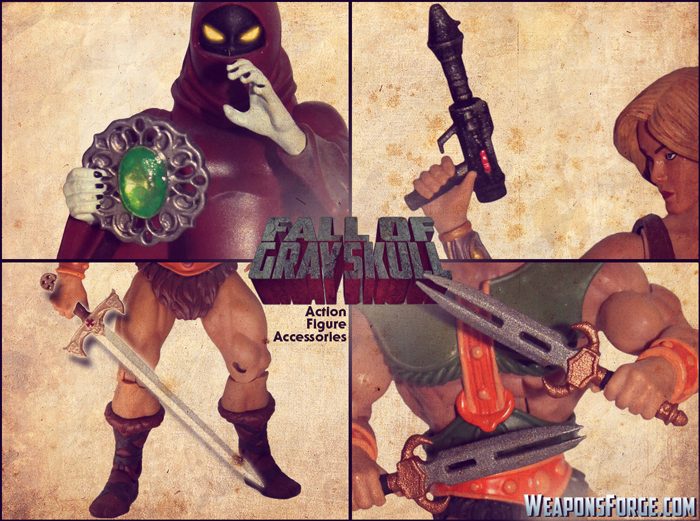 Evil-Lyn uses it under Skeletor´s command to enslave He-Man himself. This item is also available in transparent materials, so you can paint the gem in translucent colors. Teela, seen in her Battleground costume, sports this cool looking small blaster Pistol, and as you can see in the photos, it fits the Battleground Teela figure very well. So it was only natural for Daniel and his team to come up with a unique design for the Power Sword in his film, which you can now add to your collection, too! These daggers look awesome in Tri-Klops´ hands, and they also fit the sheath on the back of his armor. After all, he does sport small daggers on his armor anyway, so this is a very logical and visually exciting addition to his armory.